I’ve always been interested in food. And I’ve always loved being active. Anyway. Somehow I came across clean eating about three weeks ago- only this time I noticed it. I go to the gym about 4 times a week, run at least twice and play netball and I work hard. But my figure doesn’t budge in the slightest. So after a few hours of reading, researching and looking at all the wonderfully delicious recipes online I decided to eat as cleanly as possible. And you know- it hasn’t been too hard. I’ve just had to alter small things that I haven’t really missed. Bread was the big one for me- but I haven’t had any since and honestly I don’t miss it- the only thing I am missing is any bloating!! When I do feel like bread I have a mountain wrap instead. They may not be 100% clean but with only 4 ingredients they come fairly close! So I looked over and over in supermarkets but everything- even the “natural” muesli was loaded with sugar, vegetable oil and things I can’t even pretend to pronounce. 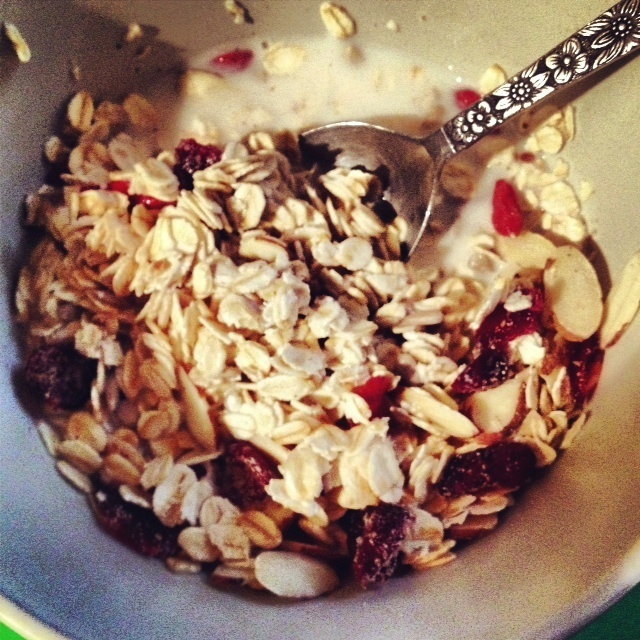 I headed to a health food store last week and found a variety of muesli that seemed good- but ridiculously expensive. So I set about making my own. So wish me luck and hope I don’t stray!